80% on road, 20% off road, which tires to choose? - Page 2 - THE PORTAL HUB - Pinzgauers, Haflingers, Volvo 303s and more! Buy a tire that you can readily get replaced, in case of a blow-out. The best tire in the world is worthless if you have to wait days or weeks for a replacement. Buy a brand you feel comfortable with, and a dealer either has in-stock, or can get quickly. Everyone here will have horror stories on ever manufacturer, and you can't be sure if it is justified, or because they hit something just right, or they wore out because the wheel adjustment or shocks weren't maintain... let alone, too high or low air pressure, or not rotating the tires ( on the rims)... The Pinz's swing axle design requires tires rotated on the rim to wear on the inside of the tire. that short tire life prob is directly related to traction, ime. softer rubber STICKS. when i discovered the extreme traction of radial swampers (a couple versions) on my 1990 burban i was very willing to accept the "non-highway tire" lifespan. it's so fun to actually STICK to stuff. i dont even remember how long they lasted cuz i wasn't paying attention. those swampers were amazing. i bet a pinz would love them, especially since you'd be doing only 68 mph max. right? A small reminder Glen, forums are for the exchange of idea's , i.e. "discussions and opinions"
Thats probably why I only listen mostly to you, Dave, Brian and Scott!!! I like facts from sage wisdom! Not peoples un informed opinions. In my opinion FORUMS are are a place for people of the same interest to get informed, tried and true facts about what they are all interested in so that they dont have to go out and try this and try that and waste time and energy to get to the best end result. SO people saying "some guy that knows some guy that sells this says that isnt any good" isnt doing anyone anything and not worth the time it takes to read it! I would much rather hear someone ask a question and have an informed response like I am used to hearing from you Oldtimers!!! Not sure if you wrote this based on my comments? But if so you may what to go back and reread if you can. The Opinion was mine no one else's. The tire store tried to sell me the tires commented on by you. Based on what I read on the data sheet (I) Thought there was a better option. Again just my Opinion. Next time if you go flaming you may what to know what you're flaming about. If your two cents differ show me on the tire data sheet. why you think this tire is a 80% street tire that ends all. Or I guess you can tell me sense you bought them they must be good for all applications and thats the end of the story every one should agree. 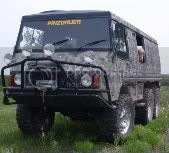 I run Goodyear Wrangler MT 285/75/16 on aftermarket 8" Pinzgauer steel wheels. In 6 years and 20,000 miles I never had a problem, never even had to add air. I drive the 80/20 road/offroad ratio, maybe 85/15. The tires are due to be replaced this year, and I plan to go back with the same ones. Recently a valve stem was accidentally kicked off while a passenger was entering, so I had zero air in the right front tire. The vehicle barely listed, and I was able to get to a tire shop, which was less than 1000 feet away, lucky for me. In the future I were 10 miles off road and this would have happen, I now know I can hobble home slowly in an emergency. Yes, I carry an inflated spare. My wheels are factory Pinzgauer wheels, painted OD with all the stampings and appearance, but have been widened to 8" with the correct offset. Send me you email address and I'll send some photos. Oh you said that! LOL! My appologies to your tire guy!!!!!!! dreadnought - do you have a link showing the goodyear tire g90 you refer to? i cant find it anywhere. vdreadnought - do you have a link showing the goodyear tire g90 you refer to? i cant find it anywhere. thx erik. ... that is one strange looking tread. sure would like to try a set. so we cant get those in the us? Only if they are DOT rated. But you could probably get a set installed in Canada as they are UK spec tires. Dave's statment is the best guideline when seeking tires. Brian, I am sorry if I afended you in any way. I have always looked up to you and what you have done for this community. Again Sorry. Someone pm'd me an educational lesson on why you might have chosen Truxs over ltb.